Project Nova, Eve Online developer CCP’s first-person co-op shooter, is effectively shutting down as the company goes “back to the drawing board” to reevaluate the game, according to a statement from the Project Nova team. 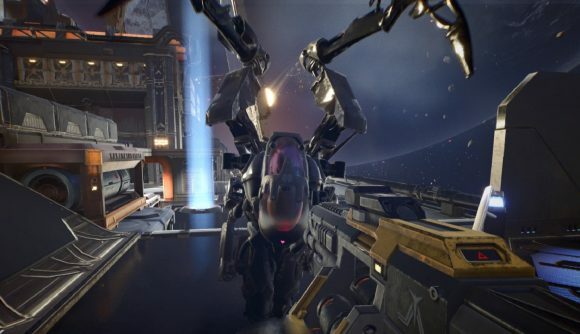 Project Nova was meant to be a robust spiritual successor to CCP’s Dust 541, and the company had brought in Nottingham-based Call of Duty veterans Sumo Digital to work on Nova’s gunplay and progression systems. However, in the month since Eve Vegas, CCP says playtesting and community feedback has led it to believe that Project Nova isn’t holding up to the company’s expectations for the project. While the note is only formally announcing the cancellation of the invite-only alpha which had been announced at Eve Vegas, the language could hardly be more dire. “We hope you understand that we need to take a step back and return to the drawing board, where we will spend more time figuring out how all this hard work can translate into something better and more meaningful for the Eve Universe,” the team wrote. Project Nova isn’t dead just yet – the developers say they’re still invested in the project, and that “Project Nova continues to evolve and we remain committed to delivering a high-quality team-based shooter experience to Eve Online fans.” Further, the studio is looking at ways to incorporate Nova’s team-based shooting experience into the larger Eve Online world. However, they’re not going to hurry.